Twenty-three years ago Elizabeth Banner witnessed the murder of her mother, and her father was sent to jail for the crime. Now, Elizabeth is part of a geological team sent to Virtue Falls to continue the research her father had started while living in that area. While there, an earthquake strikes large enough to send a tsunami racing towards the town. Although injured from the quake, Elizabeth races to the cliffs to film the tsunami as it hits town. Garik Jacobsen, Elizabeth’s ex husband and FBI Agent, races to Virtue Falls to make sure Elizabeth and his adopted mother are ok. 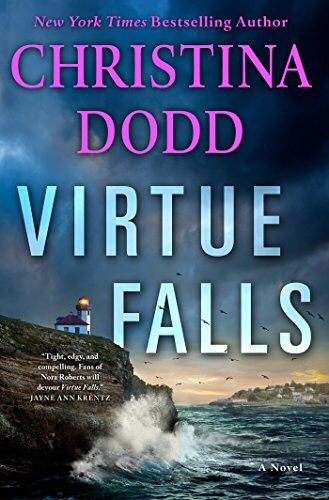 Even though they are estranged, Elizabeth and Garik still have feelings for each other, and when someone begins to attack the citizens of Virtue Falls, they begin to investigate whether her father really killed her mother. This was a fantastic psychological exploration of both Elizabeth and Garik’s feelings for each other and their relationships to all of the suspects in that town. Elizabeth was an interesting character. Very bright and totally blunt, she lacks the social skills that a woman with her looks would normally have. When she visits her father at the rest home he is interred at, she is shocked to find that none of the workers believe that he killed her mother. She still has the feelings of a little girl abandoned, and only with Garik’s help does she start to open up and care for her father, seeing past the lable of murderer she’d always connected with him. Garik uses the emergency as a reason for living again, connecting with his ex and overcoming past behaviors that may have contributed to his current unhappiness. I did find his wanting of Elizabeth at times baffling. Yes, she’s gorgeous, but her lack of common sense was kind of annoying. However, I loved the way the pair who were separated at the beginning of the book, came full circle, solving all of their problems, and all while tracking down a stalker-murderer no less. The mystery was great and the love story emotional. I enjoyed both of the main characters growth, with each other certainly, but most of all I loved how Elizabeth came to care for her father.